I don't purport to know anything about sport, truly I don't, but when Ireland takes to the international stage I tend to think I know more than I actually do. However I do become more of an armchair cheerer than an armchair critic. And so it was when it came to Team Ireland's campaign in the boxing arena in this year's London Olympics. Now, whatever mediocre knowledge I've managed to glean about our Irish soccer team's international dalliances over the years, I know absolutely nothing about the sport of boxing. To be honest I don't even like watching it. But you see the Irish Boxing team were tipped to do well in this year's Olympics and to give us our best shot at an Olympic Gold medal. That opportunity was expected to come courtesy of our wonderful Katie Taylor, who is responsible for bringing women's boxing to the Olympics for the first time this year. Sure I had to watch, whether I liked the sport or not! While the men's fights were exciting nothing could beat the Katie Taylor fight yesterday, when she was fighting for her lifelong goal of an Olympic Gold medal. Nothing was going to get in her way. Although something did try to get in our way of watching her fight to glory! 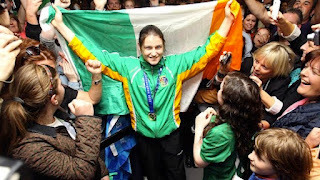 Knowing that if Katie was to be successful in her fight for gold it would be a truly memorable day, I took my boy to our local pub for an hour, to see the fight and soak up the atmosphere. We live close to Katie's hometown in Bray where approx 10,000 people converged to watch the fight on a ginormous screen. If there was ever a very bad time for a power cut to hit then this was it. With forty minutes to go that's exactly what happened - in Bray and in our village! Luckily Bray had generators to work the screens but we did not. Many prayers were said to many saints, real or imaginary, and rte player was being frantically downloaded to many phones. We imagined many electricity workers manically running around, tripping over each other, frantically switching plugs and flicking multiple switches all over the place. And then that magic moment, five minutes before the fight when the lights suddenly came back on: silence then rippling wild applause when realisation hit! There is a god it seems! Many more silent prayers were said during the course of Katie's fight, it sure was close at times! Like I say I don't like boxing but yet again I found myself screaming at the screen 'get in there... get stuck in', then wincing and looking away when a punch actually connected! Katie fought valiantly and earned her precious gold Olympic medal and presented us with another magical moment and more rapturous applause by all present. I made sure my boy watched her receive her Gold medal too, not that I'm a pessimist or anything but it may a long time before he sees an Irish gold medal again! 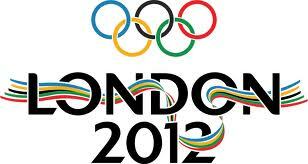 We have done well in the London Olympics 2012, for a small nation of 4 million people. The medal count is currently at 5, which might not seem a lot but the the last time we achieved that was in 1956! As most of the medals earned come from the sport of boxing I couldn't help but wonder what they're doing that other sports aren't ? I know our Government has invested money in their training, but not I'm told in local boxing clubs. I believe some money has been invested in other sports too, e.g. Athletics but the results are really coming from boxing. How are they better investing their funding then? Can we bottle what they're doing in boxing, patent it and inject in to other sports I wonder? Can we try to get to the local clubs and the young talent in all disciplines? What about the Martial Arts for example? Tons of talent there waiting to be invested in. Oh, but we are in financial straits I hear. However I'm sure there's some National Lottery money or maybe some corporate sponsorship that could be tapped into. And if I have to pay a 2% levy I'd rather it go to this cause than to bail out Quinn Family Insurance! It would provide a great return: a nation's happiness. Well done Team Ireland and all who sail in her and well done to the Irish fans once more proving what good sports us Irish are. @Blue Sky: Yes there were some 4th places. I agree, maybe giving them something to work towards, with proper supports, would help? Then again, their teens and some are very averse to the commitment required! They definitely seem to have the magical touch tactically in boxing...we NEED to replicate! @Deb at aspie in the family: Thanks and well done to London for hosting a fabulous Olympics. Oh, rant away...I love a good political rant! You are absolutely correct and it's with the youth we need to start. Crazy selling sports fields. You know, there are a lot of second level (secondary)schools here in Ireland with not only no playing field but NO GYM HALL. Well, they may have once had a gym hall but they've since been adapted to classrooms to counter over-crowding.These pupils have to walk to nearby schools who have gym halls in order to do basic PE. Some schools don't even have extra-curricular activities to introduce new sports/activities and opportunities to the kids. Doesn't bode well for future Olympians! Tops of the Town - The Revival!